Last week I took a great trip to Iowa, where I roasted that pork belly I was talking about last time, and returned home to Chicago victorious with several pounds of ham and bacon from a friend's home-raised pig named Russell. I met Russell as a baby piglet; he stood about 0'10" and weighed in at about 8 pounds. After an extremely idyllic life of eating, sleeping, and wallowing around with a couple of ducks and some huge chickens while gaining a couple hundred pounds, Russell the pig boarded the train to Russell the pork in January, and let me tell you, it was a wonderful trip. 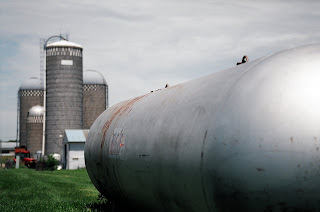 On the very farm where he lived, we cooked some Windsor Chops--a name for smoked pork chops that I'd been unaware of until I was standing next to a grill covered in hickory chips, the heavenly smell of that good smoke drifting into my nose and shirt. The chops got slow, slow smoked and while we waited, a ham roast that had been turning teasingly in a small rotisserie oven was sliced up and served as a "standing around the grill drinking beer" type of appetizer, and as I relished the browned, crispy outer layer of Russell's fat, the sun started to set on a gorgeously warm day, and the rolling hills of Iowa's shockingly beautiful landscape glowed as red as the burning hickory chips we'd entrusted with making Russell even better. (Hyperbole, perhaps, but hey, that's how it exists in my memory, and I'm convinced that pretty much everything happens in one's memory. I once persuaded myself to believe that I spent some time on Tattoine when really it was just the strangely beautiful sunset caused by the wicked wildfires in Colorado.) Better yet, we were able to pack a cooler with more of that ham and bacon, and were also generously given a chuck roast, some sirloin steaks, and a load of stew meat from another friend who buys sides of beef and has it broken down at the local meat locker. The next day there were breakfast burritos to make to cure a night of drinking. (By the way, did you know that in Iowa, there are stars in the sky, and you can see them at night? I'd forgotten, living in the city. I hear this happens in Montana, too.) The thoroughbred of a man that we were staying with, who was out with us the night before 'till all hours, went to work at 5 am, fishing at 10:30 am, and was back in time to clean the croppies he'd caught as the rest of us were just starting to function again. Amazing. 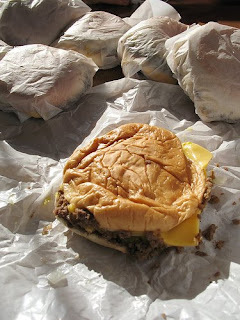 Another thing about Iowa--they've got these things called Maid-Rites, or Loosemeat Sandwiches, depending on where you're from. 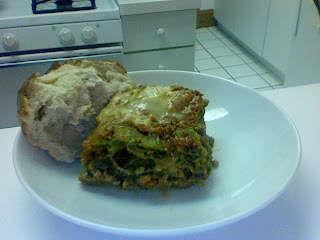 And for something so unimpressive looking and made of the simplest ingredients (Ground beef. Onion. Bun. 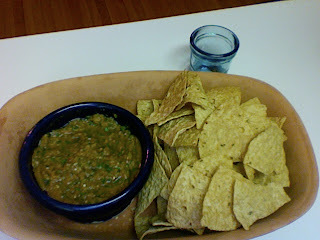 ), they are delicious and something I crave when they're not around. The stuff is simply sauteed (the actual Maid-Rite chain steams the meat, but I go for the sauteed version, believing that the older your cast iron skillet/flattop grill, the better the flavor that is going to come out of it) and put on a bun, unless you upgrade to the cheese-rite, or the coveted bacon-cheese-rite. I used to make them for the too-skinny food runner at the restaurant, but I used a crumbled piece of meatloaf, if only to pack some extra weight on him. Slather it in mustard (as much as I love strong french mustard, you kinda gotta go with yellow mustard here) and ketchup, get some pickles involved, put the sandwich in a bowl or something that'll catch the half of the sandwich that will inevitably fall off, and get a fork. The greatest. Anyway, it's really a culinary treasure trove, Iowa. It's got a pretty true version of genuine American food, and it's a great place to get in touch with what real people eat when they aren't eating foie-gras and caviar. Not that there's anything wrong with that. First off, big thanks to all of you who replied to my call for potluckees. The response was great and encouraging, and we'll be figuring out the logistics in the coming week or so to get the potluck happening. Most of all, it was great to hear such enthusiasm and learn that in a sea of $75 "Farm-to-Table" dinner price tags, I'm not alone out here in my desire to create/revive something a bit more real. I'd still love to hear from anyone else interested in the potluck; just email me at hughamano@yahoo.com. Moving on, some readers have asked why I don't really include recipes in my writing, and I'd like to explain. 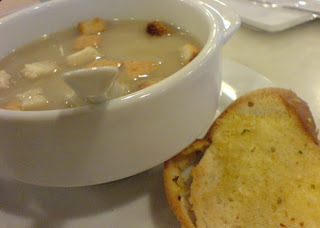 Basically, the goal with my writing is to approach food from a more conceptual mindset. Believe me, I understand the recipe thing; I used to really need them to get me going, but over the years as I've advanced as a cook (in experience--not necessarily skill level), I've found them much more useful as a muse of sorts; an inspiration; a starting point. There's a chef named Marco Pierre White, a wonderful (if psychotic) British chef, the first Briton and youngest chef to be awarded three Michelin stars (who unfortunately is now taking the Gordon Ramsay route of becoming a television personality, but that's neither here nor there). I saw him giving a recipe and demonstration of making a roasted pork belly once, with a great glaze and some roasted veg. I'm drooling just thinking of it now: the fat layer was so good and crisped up, and the sound of him cutting it...mamma mia! It was the crispiest crumbliest most mind blowingly delicious looking/sounding thing ever. And the glaze...mmm...the glaze. So, from that, in my head, it's simple: "I wanna make a crispy pork belly roast, and a sweet glaze, and some roast veg to go with it." And I think that's the best place for any cook to start. Whether they ate something, saw something, read a recipe somewhere, I think that ultimately, it's best to have a concept and visualization of what it is that you want the end product to be. So, I visualize how many people I'm feeding, and how much I selfishly want left over for sandwiches, and I go to Paulina and get a good piece of belly. Then, I go to the market, hopefully the farmer's market, but if it's winter and the market isn't really happening, it'll be Stanley's, or somewhere like that. 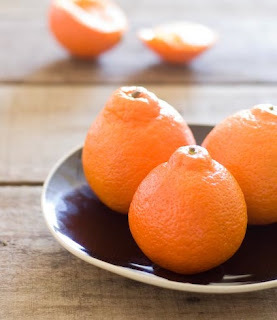 It's kind of a good time for citrus right now, so I'll pick up some oranges or those good honey tangelos that are around. 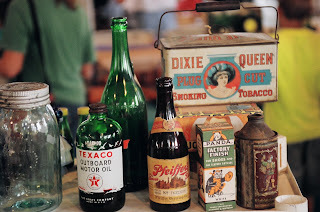 I'll consider the spices I have in my cabinet, maybe get some good cider from my friend at Seedling Farm, you know, things that taste good with pork. 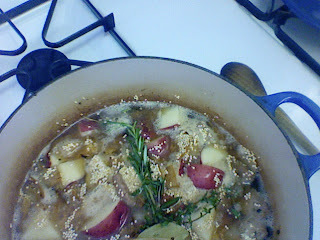 Thyme/apples/oranges/cinnamon/star anise, things you've tasted with pork before and that will work as a glaze. Honey to thicken it and make it more unctuous. Veg that looks good. Then, simple as that, go home and make it happen. Rub the belly with some olive oil, and season it generously with salt and pepper. 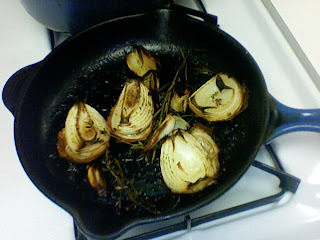 Put it in a hot stove and let it roast until soft and tender inside and nice and crisp on the outside. Throw the veg in the oven when the pork is akmost done. Turn up the heat a bit if it needs more crisping. Realize the cider is too thin to be a glaze, so reduce it, and throw in aromatic orange zest and juice, spices, and honey 'till it's nice and gooey. Remove all from heat. Slice, serve attractively on a plate. You know? It is just that easy. Of course, there are benefits that experience brings, and I'll concede that sometimes to gain this experience, recipes are necessary as a guide. Especially with scientific things like baking and brines and cure and that sort of thing. But the more you cook, the more experienced you become, and the more you believe in yourself as a cook. And the easier it is to know when a roast is done, flavor combinations that work, what product looks good, and how much you need to get. And this is the reason I'm aiming my writing away from recipes. You see, when recipes are followed, they tend to make cooks a bit short-sighted. "The store only has light brown sugar and no dark brown sugar!" 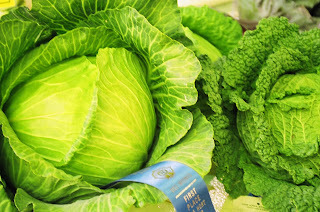 "My recipe calls for kale and all they have is the blue ribbon cabbage!" "This recipe calls for organic milk from the morning milking of Ayrshire Cows by Amish Farmers on the third morning after the blue moon and all the Jewel has is commodity Dean's brand milk!" I believe that cooking and the ability to cook is inside each and every person--it has to be, as preparing and eating food is one of the few basic instincts necessary for survival for everyone on the planet. We just need to find a way to unlock and remember that knowledge and understand what our senses are telling us, and learning from recipes is a great way to do that. But as we fill our mental larder with food knowledge, those messages get bigger and more improvised based on the skills and knowledge we've obtained and honed. It's like a musician reading sheet music, or an actor holding their script on stage. And if we listen to our food carefully, and cook from the soul, we are quite capable of cooking like an improvising musician or well rehearsed actor. We can feel food as opposed to thinking it. And just as music is so diverse and so interesting, so is food. Everyone interprets their relationship with food in a different way. 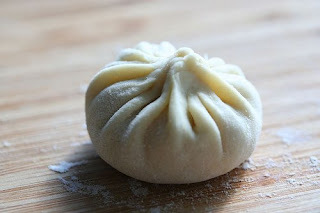 Every culture has some sort of dumpling; but ravioli is worlds apart from bao. John Coltrane's Equinox as performed by Jose James is unique from a random Columbian band. My mom's mac and cheese is different than your mom's mac and cheese. So that, in a very large, opinion-riddled nutshell, is why I don't include recipes on Food on the Dole. But I would love to make it clear, that if you ever, ever have any questions about the food I write about, or how to prepare it (or anything else for that matter), please let me know and I'll be happy to discuss it with you. 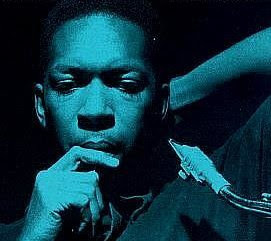 But please realize that this is about as far as my knowledge of Trane goes. So I was thinking; there's so much about underground dinners these days, and while I appreciate the idea, I feel that to some degree it's become another badge of hipster or foodie cred, with the real message potentially getting lost. Which isn't to say that I won't continue to involve myself with underground dinners, but it reminds me of several Slow Food dinners I was involved in cooking--the message is great, the idea is great, but with tickets at 75 bucks a pop, the attendees were relatively one-dimensional, demographically speaking--kind of like walking through a Whole Foods, only the workers weren't invited. And as I was, in my chef's coat, passing h'ors douevres, talking about the farms the food was from and how we prepared the food, a lot of people sort of dismissed the spiel, seeming more interested in flicking the chives off the pulled pork and blue corn hush puppies and otherwise altering things to their liking. 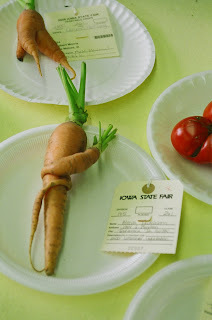 Which is kind of funny at an event designed to bring us back to simpler times, enjoying food that a host lovingly prepared and created after someone else lovingly grew/raised/produced it. I love and subscribe to the mission of Slow Food, don't get me wrong. But it was just as though too much emphasis was placed on the event, the service, and who was there; I feel it should be placed on the food, how it was produced, and the conversation held while enjoying it. That said, does anyone in Chicago want to have a potluck? Each guest bringing a dish/drink/dessert, and being ready to talk about it. Whether it's a story like the one about the family pot roast recipe (calling for a certain sized hunk of meat, only to instruct the cook to cut off the last 2 inches for some reason shrouded in mystery until grandma explained "oh! well, otherwise it wouldn't fit in the pot we had! 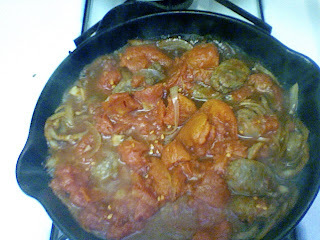 "), or a story that starts out as "Well, I'm a terrible cook, so I made...", let's get together and eat some casseroles and more, anything really, and (re)connect with food and others. Vegetarians and carnivores alike are all welcome. Sound interesting? Email me if so at hughamano@yahoo.com, and we'll get something together. What'll Ya Have? Whatcha Been Havin? 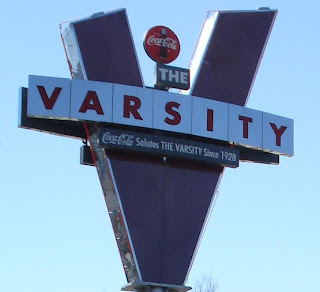 Has anyone been to The Varsity in Atlanta? If not, do so for a plethora of onion rings and burgers and fried peach pies. But this is not a story about The Varsity. I usually try to keep some potatoes and onions on hand; this way I’ll always have bulk and flavor, two things that tend to be in short supply when unemployment comes around (or stays around...and stays around...and stays around). I also happened to have about a quart of that wonder grain quinoa, and my freezer’s got a bit of Italian sausage and some bratwurst that I got from Holzkopf Meat Market on Broadway and Granville here in Chicago. It’s a great, family run meat market, with knowledgeable, friendly butchers running the shop. I had some Thuringer from them, too, but that didn’t stand a chance of going into the freezer as I devoured it all pretty quickly. Anyway, I cut up a bratwurst, fried it in a touch of oil, then added onions; when these had caramelized a bit I added some quinoa, potatoes, rosemary and thyme. I threw in a cube of super stock from Thanksgiving (I took what was left of the turkey carcass, as well as the veg that I stuffed it with, put it in my beloved stock pot, covered it in water, and let it simmer for several hours. After straining it, I reduced it all to about two ice cube trays worth of super concentrated, flavorful, dark stock. This resided in my freezer, and a cube was added to anything that needed flavor. A great way to get even more from the prime bird I’d gotten my hands on.) and put the lid on and let things roll until the quinoa was cooked and the potatoes were soft. I seasoned with some salt and good vinegar, then topped it all with a bit of olive oil, and even grabbed the mustard towards the end and slathered it on. I find mustard to be a great accompaniment to everything...the acid in it brings out so much flavor, and the spice adds another component of depth of flavor. 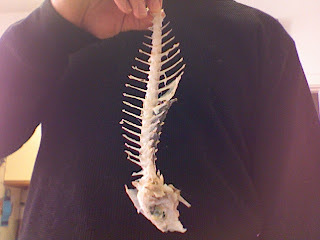 Another thing made from what was leftover was when I had some chicken legs and mushrooms laying around. (I’d had the chicken from a dinner I cooked for some friends where I got all Tuscan and stuffed the legs with sausage before browning and roasting them, serving them with white beans and braised kale.) 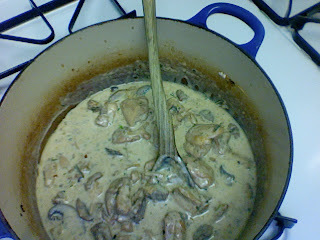 In this case, I cut the chicken up, browned it, and threw the mushrooms in; onions and garlic made the scene, then once everything had gotten to know each other, I sprinkled a bit of flour on top, let things get nutty and then slowly added milk. 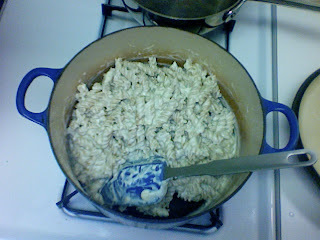 It got real thick and creamy and good; a turkey flavor cube went in and it all got tossed with a bunch of pasta. I think it was snowing that day, or at least really cold, and this was perfect--something that really stuck to the ribs. Where'd I Put My Good Cassoulet Spoon? A friend of mine "second-person invited" me to what he referred to as a cassoulet party last weekend, and naturally, I dropped everything and went. As I've said before, anytime someone extends an invitation into their home (or in this case, someone else's home...gulp!) to share a meal of any kind, I'm there. And cassoulet? Anyone would be mad to turn this offer down, and when mention was made of a well stocked cellar of French wine, I shaved my weekly shave, put on my clean shirt and got in gear to go. Now, cassoulet is one of those things that everyone familiar with it has an opinion on. It's from here, it's from there, it has this in it, it has that in it. But that's what makes it, and any dish like it, so great--it'll have a different personality every time you eat it. It seems to come from the south of France, and for those of you who aren't familiar with it, cassoulet is a wonderfully slow cooked casserole-type dish (the name comes from the glazed earthenware container is is traditionally cooked in, a cassole) of white beans, duck or goose confit, and various sausages and meats. 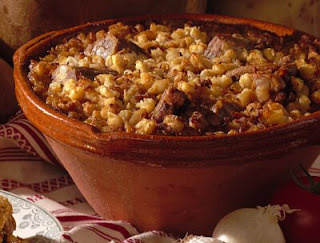 Larousse Gastronomique offers that there are three main types of cassoulet, calling these examples the "Trinity": The "Father" being from Castelnaudary (supposedly the oldest and containing the largest amount of pork in the form of loin, sausages, ham, and rinds), The "Son" from Carcassone (using mutton and , when in season, partridge), and the "Holy Ghost" from Toulouse (with similar ingredients, in smaller proportion, to that from Castelnaudary, with lard, mutton, and importantly, Toulouse sausage added). 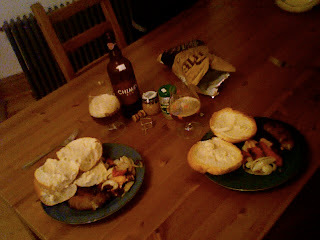 I was fortunate enough to sink my unworthy choppers into a version that was heavy on the duck fat and Toulouse sausage. And I find it pertinent to mention that the wonderful woman who made the cassoulet is a vegetarian, yet cooks this enormously meat-heavy dish with the soulfulness of the heartiest French farmer. 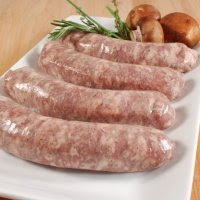 In fact, she told me, of her insistence on using Toulouse sausage, it "smells like southern France, the same way that truffles and cepes and the local chevre cheeses do." It's got a certain terroir, and it's this unmistakable characteristic that makes this version of cassoulet this version of cassoulet. And it doesn't have to be French for this to happen. I've had a thousand different versions of Mac and Cheese, and is it ever bad? I mean, Kraft Mac and Cheese is gross, sure, but somehow it tickles that nostalgic nerve the way only some really bad foods do, and it's designed to bomb us with fat and sodium and sugar and taste good. Same thing goes for pizza. I love really, really great pizza (in fact, my favorite restaurant in the world, and yes, this includes such competition as Charlie Trotter's, L’Atelier de Joël Robuchon, Chez Panisse, and all the high-brow standards, is the original American Flatbread in Waitsfield, VT), but somehow, whenever I'm around pizza of any level, I revert to, as a friend described, "an eight-year old with wet hair and a towel wrapped around his waist yelling 'PIZZA!!!' at some pool party, shivering while calculating how much pizza can be consumed in how little time and how much time will have to pass before being able to get back in the pool." To that end, even bad pizza is still pizza. Ah, the standards of an eight-year old. Anyway, more importantly, the general vibe at the cassoulet dinner was what it was all about. Standing in a warm kitchen with great people, talking, eating cheese from someone's childhood in France, bread I made, and drinking that great wine--that's really special. Winding down a great meal with a slice of homemade chocolate cake, trying new things such as tasting the cake with a bit of the Roquefort from earlier, finishing with coffee roasted and brought by my friend. The grace of genuine hospitality and generosity, welcoming of new (and sometimes uninvited!) friends as though they were old friends; that's special, and perhaps too rare these days. Maybe this rotten economy will cause more people to stay at home and cook; I would honestly love to see a resurgence of the potluck. Here's hoping we can get that back.